Please Read Posting In It’s Entirely. This unit is in great condition and clean of any major damage. It does however have the tiny scratches as listed below. Other then that it’s clean. We will remove it from storage, unwrap and fully inspect this coming week and post any findings here in this section if there any changes. 48 Wolf Gas Range Model # GR486G. Background Info: 1st and foremost we are not an appliance store. After 15 years of remolding homes we stoped to move into my other business that we own that needed our full time attention. Almost all of these appliances are in excellent New/Used condition. All of these are Brand New appliances that were displayed. When I say minor blemishes I mean light scuff marks or Tiny scratches that can be very difficult to see unless the lighting is right and you’r looking at it from the right angle. Some can’t even be picked up without a professional camera. So they are tiny. When you look at them normally in your home you cant even notice them. (These appliance I will take pictures of and post in the Defective Description) All these have been tested and all work just fine. NO NEW ACCOUNTS OR BUYERS!!!! If there is a problem I’ll fix it. Cash in person, Certified Funds, All major credit cards through our processing company. This is for several reasons. My current job requires me to fly in and out to different location across the US 5-10 days at a time. So depending on the current weather conditions it can also delay things. New York- 10001, 10002, 10003, 10004, 10005, 10006, 10007, 10008, 10009, 10010, 10011, 10012, 10013, 10014, 10016, 10017, 10018, 10019, 10020, 10021, 10022, 10023, 10024, 10025, 10026, 10027, 10028, 10029, 10030, 10031, 10032, 10033, 10034, 10035, 10036, 10037, 10038, 10039, 10040, 10041, 10055, 10065, 10075, 10101, 10103, 10104, 10105, 10106, 10107, 10108, 10110, 10111, 10112, 10113, 10116, 10118, 10119, 10120, 10121, 10122, 10123, 10128, 10150, 10151, 10152, 10153, 10154, 10155, 10158, 10159, 10162, 10165, 10166, 10167, 10168, 10169, 10170, 10171, 10172, 10173, 10174, 10175, 10176, 10177, 10178, 10199, 10203, 10249, 10256, 10268, 10270, 10271, 10274, 10276, 10278, 10279, 10280, 10281, 10282, and 10286. Staten Island – 10302, 10303, 10310 Florida – 33101, 33109, 33125, 33126, 33127, 33128, 33129, 33130, 33131, 33132, 33133, 33134, 33135, 33136, 33137, 33138, 33139, 33142, 33144, 33145, 33146, 33147, 33149, 33150 33101, 33109, 33125, 33126, 33127, 33128, 33129, 33130, 33131, 33132, 33133, 33134, 33135, 33136, 33137, 33138, 33139, 33142, 33144, 33145, 33146, 33147, 33149, 33150,33102 & 33103. Also don’t worry about the drivers time. You would be responsible for filing a claim with the carrier yourself and there is no guarantee it would be covered. I recommend you find someone local or some friends to help you move it. As long as product is received back to me undamaged. 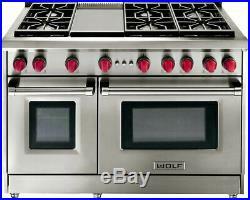 The item “48 Wolf Gas Range Model # GR486G” is in sale since Thursday, March 7, 2019. This item is in the category “Home & Garden\Major Appliances\Ranges & Cooking Appliances\Cooktops”. The seller is “raider4life1974″ and is located in Las Vegas, Nevada. This item can be shipped to United States.